211 LEGO pieces for building the board and a small minotaur. 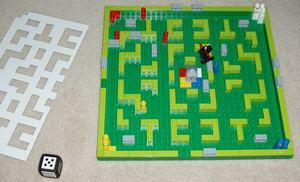 Gameplay: The first step is to build the game, following the instructions as with a normal LEGO model. Happily, the box is big enough to store the maze even when completed, so there's very little set-up involved after the first play - a cardboard template allows the board to be easily reset to its starting layout. Players take it in turns to roll the special 'LEGO Dice' and move a piece as indicated. If they roll a number, they can move one of their heroes a corresponding number of spaces through the maze. If the grey side comes up, the player can move one of the grey walls within the maze or add in an extra one from the edge of the board. A roll of black means the minotaur can be moved eight spaces. Diagonal movement, climbing over walls and passing through other pieces isn't allowed. The minotaur begins the game in the centre of the board. 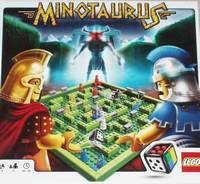 If it runs into a hero, the hero is returned to its player's starting corner and the minotaur goes back to the centre. There are options for other rules, such as replacing the 3 on the dice with a green tile that, when rolled, allows a hero to jump over a hedge. Game length: 20-30 minutes (plus around half an hour for initial set-up on the very first play). Age: 7+. The freedom of movement available and the need for simple strategy mean that younger children will need a lot of help. They'll also struggle with the fiddly pieces. Teenagers won't be entertained for long but there's enough to the game to ensure that they won't complain too much if forced to play with a younger sibling. Comments: Someone at LEGO deserves a big raise if they haven't had one already. The idea of producing sets that build into games is genius. When I was a kid, I liked to make my own LEGO designs, creating them, playing with them and then taking them apart to build something better. My children are different. They see the instructions as a puzzle or challenge. Once they've figured out how to put the bits together and they've built the model, they're done. They put it on the shelf and go and do something else. We have enough plastic ornaments as it is; we don't need expensive, DIY additions from Denmark. The beauty of Minotaurus is that once they've solved the puzzle, they're left with something they actually have a use for at the end. The game requires basic tactical thought and provides opportunities for vindictive reversals of fortune but there's enough luck involved to ensure that even the youngest player has a chance. In addition, it encourages the creation of house rules and there's the option of sharing them with others on the LEGO website. The whole package is a successful combination of the tactile construction of LEGO with the longevity of a board game, complete with opportunities for creativity and design. Genius. That said, if you're simply wanting a board game with a mix of luck and strategy, the benefits of LEGO are less clear cut. Ultimately, the game experience is helped and hampered in equal measure. Since Minotaurus works on the small scale of individual LEGO nubs, counting spaces and moving the pieces can be fiddly. If the game wasn't built from locking bricks, however, the board would need to be four times the size and there'd be much laborious set-up at the start of every session. Conclusion: A good implementation of a great idea. Too much luck to keep older children interested for long.